It will be interesting though to witness the strength of public opinion, on the ground, so to speak and I’ll certainly report back to you. It would be wise though, not to underestimate the potential for violence against our own citizens and society, as a consequence of the ill-considered publication of the cartoons - you can find them here - that so inflamed Islamic opinion both here and abroad. When this story first broke I quite sympathised with the Islamic community as I don't think any religious personality should be disrespected. Now after watching the irrational and frenzied reaction of considerably more than a VOCAL MINORITY as the media calls it I couldn't care less if they're offended. The West enjoys freedom which has been paid for by countless wars and the sacrifices of many ordinary people. For the first time in my long life, I now say if you don't like it here then go and live in your "perfect Islamic Republics". Oh dear, I forgot, they don't have free education, housing and welfare etc do they or freedom of speech. They do however have an ample supply of dictators and torture chambers. I still just can't work out why they hate us AND want to stay here!!"!!!! 4 months to work up agitation over this issue? The furure has nothing to do with the 99% of law abiding citizens who follow the path of the Prophet but with the radical fringe element. All muslims are likely to be offended but their tolerance and understanding would not lead to violence. demonstrators waving inflamatory RACIST posters and clearly inciting violence and religious hatred not been arrested or the demonstrations stopped and at least cautions given? Go and stand in Cecil Square with a placard calling for the violent end to the lives of all Muslims responsible for persecuting Christians in Sudan; Iraq, Saudi etc and see how long it would take to be arrested; 3 minutes? The cartoon about running out of virgins in paradise was at least a witty comment about extremists and I am sure was appreciated by some of my Muslim colleagues! Let us all try and understand that we must not allow the lunatic Muslim fringe to push us into polarised and extreme positions; they are about as representative as the BNP are in this country. Interesting you should bring up the BNP. The leader who was recently in court for calling Islam a dangerous, violent religion which is not compatable with the values of the West would not have had to hire a lawyer if the case was in court this week. He could have just pointed to the behaviour going on now. Enough said, case dismissed!! I'm sure the BNP will be sending a huge Thank You card to the demonstrators for probably polarising this country and getting them more recruits than 50 years of campaigning. I cannot understant why after all the furore of 7/7 and the efforts to keep communities together, that Muslims here are biting the hand that feeds. Violence is not the exclusive right of annoyed Muslims and they should be aware that there are plenty of predatory non-Muslims who are just waitng for an excuse. Who will they blame then? Is it such a weak and flawed religion that a couple of cartoons can throw the entire (it seems) islamic world into a state of war-like global fervour. Theses people are just bullies Flexing there muscles because they dont like what somebody else has said. 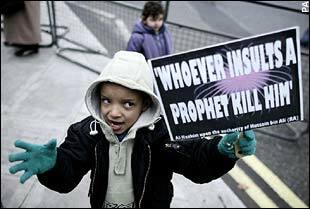 If islam is so bloody peacful why do thousands of death chanting zealots appear across the globe just because of some cartoons. They talk about a small minority of extremist but there were many many thousands of muslims all over the world shouting chanting and waving placards with 'Behead the europeans' ect. I once many years ago listened to a serman in what you would have thought was a very ordinary every day muslim Mosque, And the cleric was preaching that all non muslims are inferior and I dont mean just Christians but anybody that is not of the Muslim faith including non religious secular societies. There is no tolerance in the religion and I know that even your everyday peaceful muslim has been indoctrinated with these views.. because they have been expressed for decades by clerics in Mosques throughout this country and the world. And when we get the next "bang" in London.. which the authorities appear to view as inevitable, will Ken Livingstone and all the other Labour lovies be standing up again and praising the virtues of multi-culturalism? I wonder...? Probabaly! The cartoons had a picture of the prophet Mohammed with a fuse coming out of his turban as it his head was a bomb. How would you feel if people drew up a picture of Jesus Christ and made him out to be barbaric...lets not forget us Christians have been nothing short of bloodthirsty in the past. I would not be happy at all, nor would the major Christian leaders, including the Queen. It is inciting religious anger. I am a multiculturalistic and respect peoples right to believe in what they want to believe as long as it does not harm certain standards of free speech. The cartoons were provocative and as we can see have led to three Embassies being burned to the ground. That picture should never have been posted in the media. The everyday muslims are no threat to this country. The anger-filled clerics are. Lets get the divide clear here. By generalising we are going to lead to a knee-jerk reaction by certain parts of our society going out and beating up Muslims because they happen to me Muslims. An excellent point James and you might think that the Christian world would have been outraged if an obscene picture appeared of Christ. The trouble is that you'll find at least one in a London gallery and no newspapers offices or embassies have been burned as a result. The Islamic world does see such things rather differently to the west as the events of the last few days have shown. A singular problem lies in the difference between the Dar Al Islam. .. the land of the believers and the Dar Al Khufr the lands of the unbelievers. It is the obligation of every Moslem to spread the word and religion of the prophet and because there is no recognised division between the secular and religious, it places 25 million Moslems in Europe in a very difficult cultural and religious position, where the ultimate objective has to be the replacement of our law, which runs contrary to Islam, with Sharia, which represents the divine word of God. This is, I fear,just the first round of confrontation in what is going to be a century of divisive philosophical strife between our two cultures, with Europe, as the battleground. As long as the Islam/Moslem teach hate for other religions, there will NEVER be peace. It has always been so throughout history. Kurdistan was disbanded and split between Iraq/Iran/Turkey, because they were always causing some kind of War. Seems to me that something strong should hit those people, something that will make them realise that they are 'normal' humans, just like us.... if they don't want cartoons to be drawn about their God/Prophet, then they should learn to live in PEACE and stop burning OUR flags and efigy's of our Leaders. (even if we dislike them ourselves). If one could just convince the plebs that the Iraelis are not really that bad (I think their Leaders are aware already). Then, but only then, can there be a chance for PEACE in the Middle East. You have hit the nail right on the head...Religions are very dangerous. Wars have been and are fought in the name of them. When is the human race going to drag itself into the 21st century and start seeing the world and all that is in it for what it is. Weather its the Christian Bible bashers of the western world or the Islamic clerics of the Eastern world. We are but a grain of sand in a Universe that probably is completely unaware that our planet even exists. We are just animals on our planet just like all the other animals on our planet...some of us are leaders and others are followers..Just like all the other animals on our planet. Ever since the Human animal has roamed this planet there has been conflicts and wars...and that is the way it will always be...The human animal will never live in peace with his fellow man... if its not because 'I am white and he is black' or 'he supports Arsenal and I support Chelsea'or 'I live on one housing estate and he lives on another' We are tribel and that is that. The gulf in our 'cultures' in our 'beliefs' and in 'our way of life' is so vast makes it's impossible for us to live in peace together its just not the human animals way. The biggest problem is that of education. People dont really understand the history or the facts. I dont know the full facts or the history, but I know enough to get by. Its said that ignorance is bliss. In my opinion, ignorance simply leads to conflict. The religious texts were written for a completely different world than the one that exists today. The problem also stems from mis-interpretation of the text or worse, accepting someone elses interpretation without questioning it. Mis-interpretation of religious texts leads to suicide bombers and terrorist attacks. It also leads to racial hatred and race crime. I believe peace is acheivable but it must start with the public being educated properly, not through a biased media. "everyday Muslim's" bombed the tubes and that London bus. What nice people. (cynic). "everyday Muslim's" are burning Embassy's across Europe. What nice people.(cynic). "everyday Muslim's" should be quiet, well behaved people. Or face the risk of deportation (as in other Country's). "O you who believe! Do not consume your wealth in the wrong way-rather through trade mutually agreed to, and do not kill yourselves. Surely God is Merciful toward you"
"And take not life, which Allah has made sacred, except by way of justice and law". The suicide bombers are not real muslims but instead are an extreme group which does not adhere properly to the Islamic faith as laid down by the Qur'an. I reckon the radical clerics persuaded them that suicide bombing is justified. Everyday muslims are hounded in society these days because people are so very quick to generalise, as the last comment did. Theres a huge difference between normal muslims going about their life meaning no harm to anyone and just practising their religion as they are prescribed to, and extremists who believe killing people in their dozens is the way to heaven. There are of course many Muslims who would not for one moment condone what goes on in the radical Muslim world..But as with 'Salmon Rushtie' and 'The satanical versus' and with the 'Danish cartoons' there seems to be a massive explosion of anger and destruction by Muslims who would not consider strapping a bomb to there bodies and blowing themselves up and as many other people as they can in the name of Allah. It appears to me that that there are alot more clerics preaching radical sermons than there are priests and vicars preaching radical Christianity, and there appears to be a lot more outcry from Muslims when something happens than there is when the tables are turned..
Did Christians go out on the streets baying for blood and death to Muslims when the London tube and Bus bombings happened? No. Go up to Bradford and talk with the young Pakistani community there and then come back and tell me...Its only a handful...Islamic fundamentalism is spreading like wild fire in the young (dissafected) Muslim communities in this country and throughout the world. This is not a knee jerk reaction ..More and more young 'western' born Muslims are becoming more and more radical in there views. At one time you only heard of human bombs in countries like Palestine...Now we have seen how radical young British muslims are becoming first with the British born bombers that went to Israel and now the 4 London bombers and then the 4 Failed London bombers. I'm sorry it is happening in front of our very eyes...How long will you continue to bury your heads in the sand? Lets not go overboard about the threat of Muslims and the Islamic faith, Chris. The reason why many people believe that Muslims are such a threat is because the media has told them that they should believe that to be the case. The Sun and other tabloids and reactionary and dont explain the full story. If we are going to have a debate on the threat that Muslims or Islam poses in Britain we should have some numbers and facts. 1.5 million Muslims in Britain. The population of Britain is now 60 million. Therefore each Muslim is outnumbered 40 to 1. We arent therefore being over-run with them. Its a proven fact that after the July Attacks, faith hate crime in London went up six-fold. That was a backlash against Muslims. Here in Thanet, if you hear about a race attack, its never a black or asian attacking a white person. Its the other way round. I dont think the problem is that there are more Muslims with a grudge to bear. Its that the media is stoking the fire on this debate by stereotyping muslims as a threat to this country. Last week the Sun had a picture of a toddler with a hat on saying "I Love Al-Qaida". This is what is causing the problems. The media tells the country that Muslims are a threat, therefore the police think that Muslims are a greater threat and crackdown on them. The police increase their use of stop and search on Muslims and they feel they are being blamed for something they havent done, which leads to resentment and frustration. One particularly frustrated muslim who feels they are being prejudiced by the community finds a cleric who preaches hatred. They find someone who has a gun and then goes out and kills someone. The media has its headline... "Muslims kill". The cycle continues. Its no wonder why the July Attacks happened if Muslims feel they are being bullied an prejudiced themselves. The media stokes the fire here and the public take it in without question because the media is expected to tell the truth. In fact the media manipulates an incredible amount to that it fits in with the managements ideology and aims. The Sun sensationalises stories in order to get people to read the paper. Muslims are easy prey. This is Media Studies 101. James, I am not sure about going overboard...Young Muslims in this country are more radical now than there parents ever were. That says one thing to me...Be careful there are some dangerous Muslims out there who may want to harm you because of there radical views. Why would he be saying that if he did not beliieve it himself...Simon is not a 'Sun reporter' I do not read the Sun indeed I do not read any Tabloid newspapers. This particular Simon is quite close to the issues and surrounding fears, described here as they are perceived by police and government but I am not able to share conversations and more detailed information which lie within my professional activities. We must retain perspective over this issue. Radical muslim elements have waited 4 months to set up a 'spontaneous' outburst of indignation about the cartoons. The more extreme the reactions in this country to a small handful of extremists waving illegal and offensive placards, the better, as far as the extremist is concerned. We fall into the trap laid for us if our response is not balanced and fails to recognise the 99.9% of muslims in this country who are law abiding citizens. Let us hope that the Met will quietly go around visiting and cautioning and arresting if necessary any on that demonstration who were guilty of breaking the law. The last thing we want is an hysterical outburst from our own lunatic fringe and heaven forbid any retaliation against fellow countrymen simply because they are muslims. If the spectre raised by Enoch Powell is not to haunt us in the years to come we must encourage every citizen in this country to regard themselves as a loyal british subject first and a muslim or christian second. The lessons of recent history in the former Yugoslavia illustrate the mayhem that can be unleashed when extremists stoke the flames and polarise and then radicalise communities. A follower of Islam will not put there religion second to being a loyal british subject. Islam is the be all and end all of everything. James, I would value your opinions more if you didn't put money before principles. I would be happy to accept a devout muslim first and a loyal british subject second on a matter of religious conscience. Why cant a Muslim be both a Muslim and a Briton? What stops them from being able to be both? Im not a practicing Christian (though at one time I truly thought I believed - I still retain a moral outlook despite not being a practising Christian) but it doesnt stop me from being a Briton. Anonymous of 7:49pm (post your name, no one will mind) is absolutely right. Extremists are the ones causing the problems. They are preaching the hatred of Islam, which does not actually reflect true Islam and for that they should be arrested and face the law as anyone else who breaks the law should do for breaking the law, on grounds of racial hatred. Abu Hamza (known as "Hook") is currently in court facing such charges, thankfully. It looks like Ive been caught out by someone from the nearby area! I may not like what the Sun says but I believe in free speech. If someone has something to say then I will not stop them from saying it. I may not like it but I will listen and try to understand their point of view. I do not detest the Sun but I dont think it reports proper news.